Do you notice an increase in pink every October? From politicians to football players to community members, the color seems to pop up everywhere! Since 1985, when National Breast Cancer Awareness Month was founded, October has been designated as a time to increase awareness of this deadly disease. Pink ribbons – and pink in general – point to the need for awareness, research, and fundraising. Not surprisingly, these are all important aspects that work toward the prevention, diagnosis, treatment, and cure for breast cancer. While some breast cancer stats are staggering – according to current statistics at Breastcancer.org 246,660 new cases of invasive breast cancer are expected to be diagnosed in women in the U.S. in 2016 – there are also some hopeful breakthroughs. Read on to learn about what you can do to help reduce your chances. Thankfully, breast cancer incidence rates began decreasing in the year 2000 – BUT the danger is still very real, and prevention and treatment still have a long way to go. Did you know that breast cancer is the second most commonly diagnosed cancer among American women? While skin cancer is number one, a HUGE amount of U.S. women will develop invasive breast cancer over the course of their lifetimes (about 1 in 8). Shockingly, a woman’s risk of breast cancer approximately DOUBLES when she has a first-degree relative (mother, sister, daughter) who has been diagnosed with breast cancer, but at the same time, about 85% of breast cancers occur in women who have no family history of breast cancer. These cancerous, genetic mutations are said to be a result of the aging process and life in general. This is where small, lifestyle choices – like flossing every day – can have a positive effect on your overall health. As studies have shown, there is a link between breast cancer and dental health. In fact, if a person has poor oral health or periodontal disease, they may be 11 times more likely to develop breast cancer! Luckily, your oral health habits are something that you have control over! With proper care, you and your dental team can monitor and reduce your chances of periodontal disease and other health-related issues. Brush twice a day. Use a toothbrush and fluoride toothpaste approved by the ADA (American Dental Association). Floss daily. Clean between your teeth with dental floss or another interdental cleaner every day. Visit your dentist regularly. Schedule your professional cleaning and checkup every six months. Good oral hygiene includes brushing, flossing, and regular dental visits. 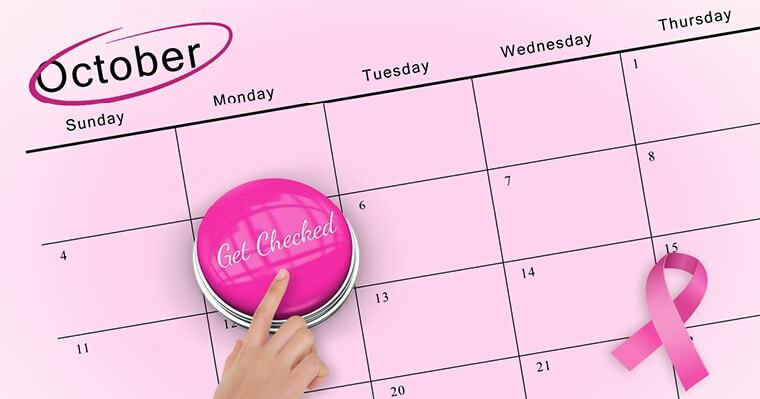 While this deadly disease is on the decline, it’s still important to use October to remind your friends and family about the necessities of breast cancer awareness. Remember, early detection is key, and it truly can save a life! Are you due for your next hygiene visit? Just call us at (951) 925-6596 or contact us online and we will be happy to help you. How do you show your support for Breast Cancer Awareness month? Please tell us in the comments below!